What a weekend. Such a weekend it’s taken me more than a week to write about it, so lets just start from the beginning. Early Friday morning my friends Mike and Shawn of The Beer Genome Project gathered with another friend Jason and myself to start our adventure to the land of Chicago. 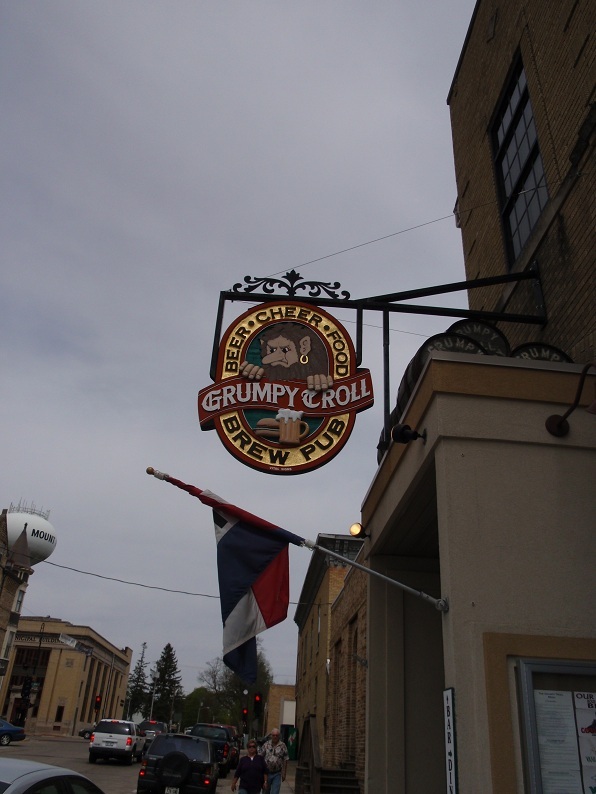 On our way through Wisconsin en route to New Glarus we realized we were very close to The Grumpy Troll Brewpub and decided to stop by for a bite to eat and a few libations. Over all the food was decent, my beer cheese soup hit the spot but was nothing particularly special, though my corn muffin was awesome and Shawn seemed to particularly enjoy his black bean burger which looked very natural and hearty. I went with a pint of their Imperial IPA called Maggie which was dandy but of all the beers we sampled their two porters really stood out, I particularly enjoyed the Amnesia Baltic Porter which Jason ended up bringing a growler of home. Another unique brew that was highly enjoyed was Slow Eddie, a jalapeno session beer with some serious jalapeno flavor but not overly intense heat. 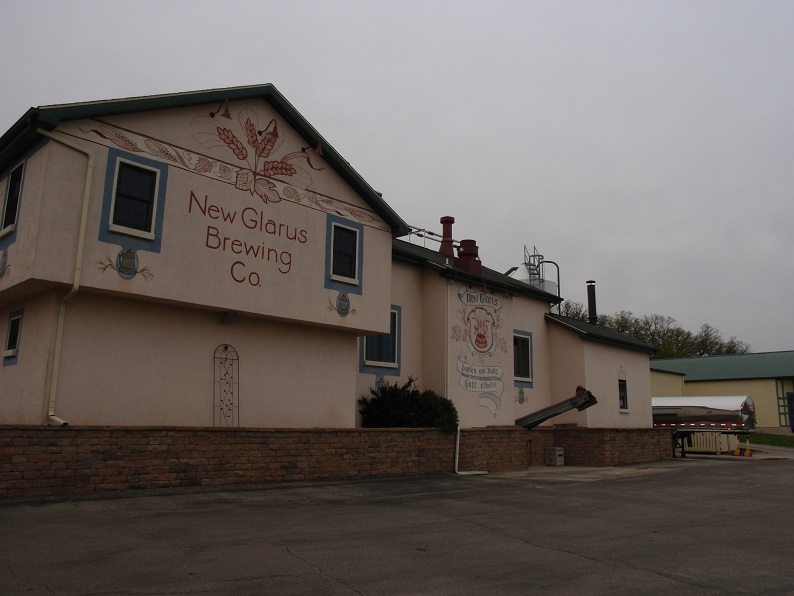 After driving through many winding, hilly roads we eventually made it to New Glarus and quickly checked out the exterior of their old brewery and made our way another mile down the street to their fantastic new brewery. 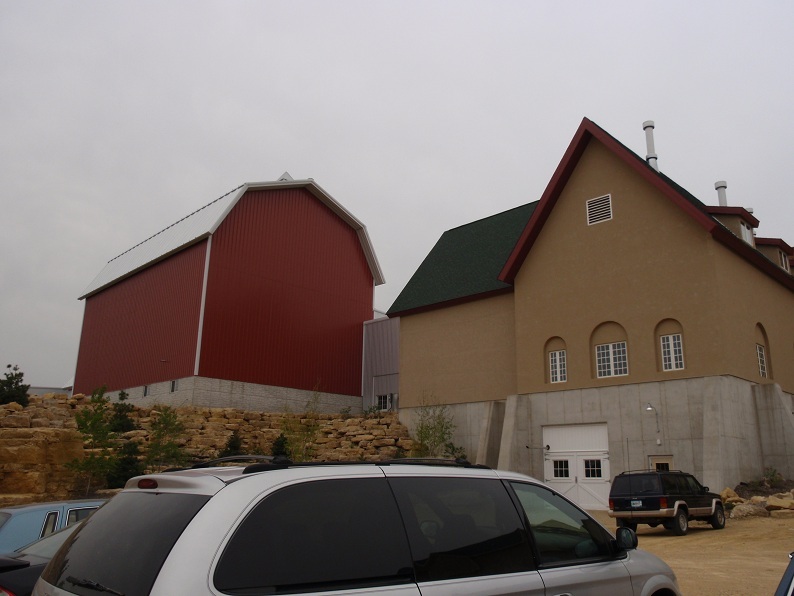 The exterior of their new brewery is fantastic with cascading rocks and water running down the front of the building which is divided into three major sections: The brewery, the gift shop/tap room and their storefront. 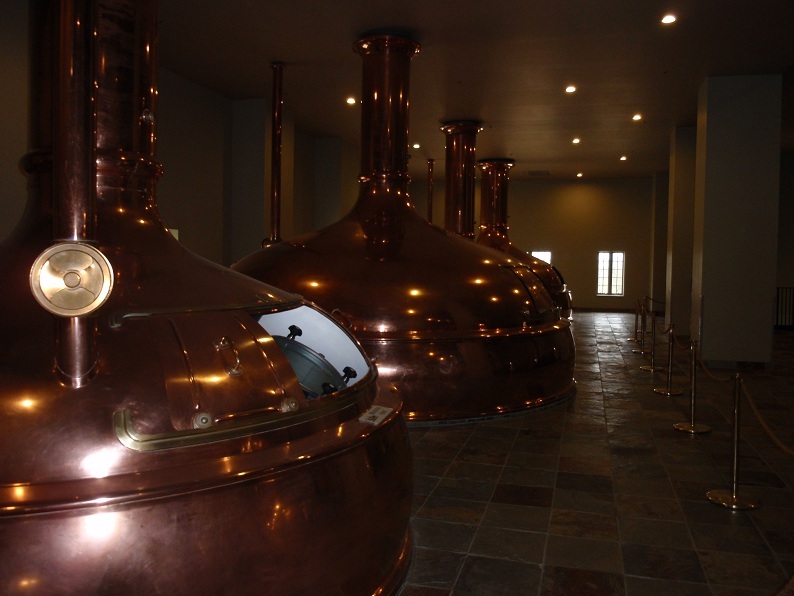 Not only is the exterior attractive but the massive brewery is absolutely fantastic. Not only is it the largest brewery I’ve ever seen state side but you are also allowed to view almost the whole place at your will free of charge. First of course we had to grab ourselves a beer. You can either get a pint for $6 and keep the glass (a $5 value) or you can get 3 pours in a sample glass which you also get to keep (1$.50 value) for $4.50. I started with their Stone Soup their Abby, which is not overly complex but sold enough. I also ended up trying a bit of their Moon Man Pale Ale a gently hopped ale that was very mellow in the finish with hops only being present in the beginning of the sip. The favorites of the day were their classic Wisconsin Belgian Red [review] which was fantastic off tap & their new Golden Ale a delicious very purely Brett flavored ale that I will write about in more detail when I open my bottle. As you walk into the towards the brewery you see their lab and quality assurance with people hard at work ensuring you get the best beer possible. 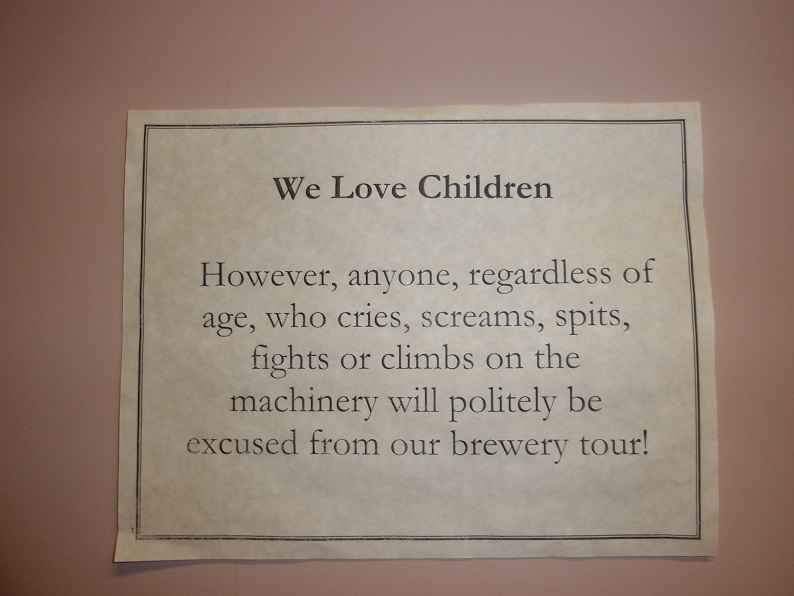 Upon entering their brewery proper the wonderful smell of Spotted Cow being brewed was overwhelming and fantastically bready. 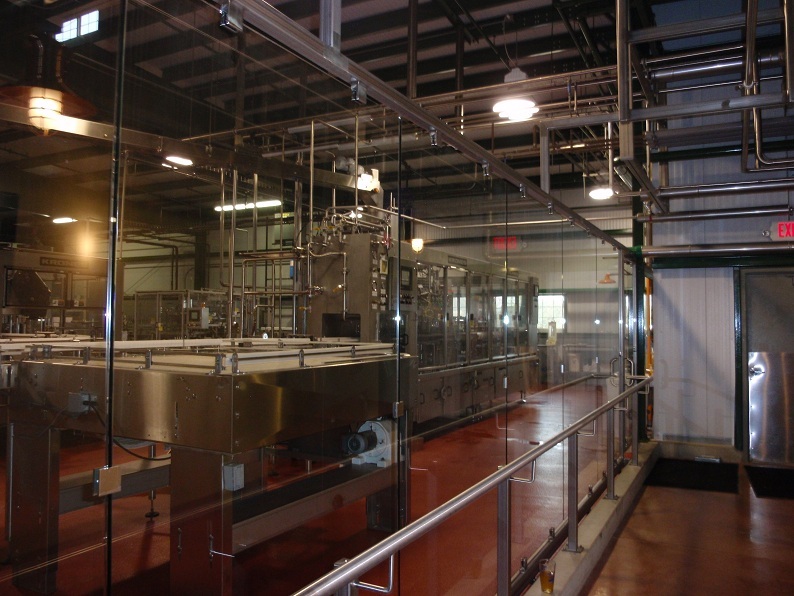 The whole brewery was fantastic but the things that stood out the most for me were their insanely large fermenters and their massive magnetic bottling line. I was ecstatic to find some of their fantastic Cran-Bic at their bottle shop and grabbed two four packs but I ended up trading one back to a very happy brewery employee. A few other treasures included the aforementioned Golden Ale and another R&D beer called Two Women. Right before leaving we ran into a combination of local friends and not so local new acquaintances that had also traveled down from Minnesota together, Stu from Friday Night Beer, Aaron from The Captains Chair, another Aaron from The Vice Blog and Dave from The Drunken Polack. After some greetings and friendly harassment it was time to get a move on. After painstakingly making our way through Chicago traffic and dropping off our gear at my cousins house it was time do do some real drinking and check out what the Chicago beer scene has to offer. Some local friends of Mike & Shawn wanted to meet at the well reviewed Revolution Brewing a new brewpub near Logan Square so we hopped on a bus and ventured forth. Upon entering I immediately knew it would be a task to find the people we were looking for as the place was packed as can be. Luckily we found them near the end of the bar and managed to snag a small area near some registers, regularly moving out of the way of bussers and servers. Regardless good conversation was had and it was nice meeting some fellow beer geeks including Ken & Brad of Hop Cast, Stephen of Fresh Brew Log as well as a very nice and equally geeky gal named Sarah. On tap was a large selection of their brews and a fantastic selection of guest beers. Being a brewpub and all I had to start with something home crafted so I opted for their Iron Fist Pale Ale which was quite tasty. After that I had to sample the two beers they had on tap that were made for the Craft Brewers Conference that had been held earlier that month: Lagunitas Chicago Fusion Ale & a hoppy Two Brothers brew I can’t recall the name of, both of which were solid but nothing mind blowing. Another ale from Two Brothers that was very nice was their new Resistance IPA which is fermented in their new foudre’s (large oak barrels) and is wonderfully balanced and smooth on the palate. At the end of the night I ended up sampling some of Revolution’s Samadhi Double IPA and had to get a glass for myself as it was absolutely fantastic. If we hadn’t been on our way to another bar I could have drunken it all night. Not only does Revolution Brewing have solid beers but their food was delicious as well. After about an hour wait for a table we started off with a few baskets of bacon popcorn, yes you read that right. Delicious popcorn smothered in bacon fat with crisp bits of bacon scattered and the most delicious and delicately fried sage I have ever consumed. Equally fantastic was the Working Man Burger I got complete with aged cheddar, beer battered onions, bacon and one of the most amazing and massive locally made burger buns I have ever consumed. If all that wasn’t enough one of our new friends knew the assistant brewer Matty who was courteous enough to give us a personal tour throughout their awesome brewing & cellaring area as well as their yet to be finished 2nd floor which will eventually host a 2nd small kitchen, stage and additional dining. Many thanks mate. As if we hadn’t imbibed enough we decided the only appropriate thing to do was check out Piece Brewery & Pizzeria. A nice space with much more elbow room and a wonderful aroma of pizza floating through the room. There we ran into a few more local friends Dean & Rita and enjoyed some solid brews. I started with a pint ofÂ Dysfunctionale a wonderfully hoppy Pale Ale and couldn’t help but continue coming back to it and it’s fresh resiny citrus characters. I also sampled a bit of a Strong Ale, a Smoked Stout and pint of their IPA collaboration with 3 Floyds hilariously titled Marketing Ploy, all of which were rather tasty. You can read my review of Dysfunctionale here. Unfortunately the two times we made it there we didn’t have appetites because their pizza smelt fantastic, definitely a to-do next time I’m in town. 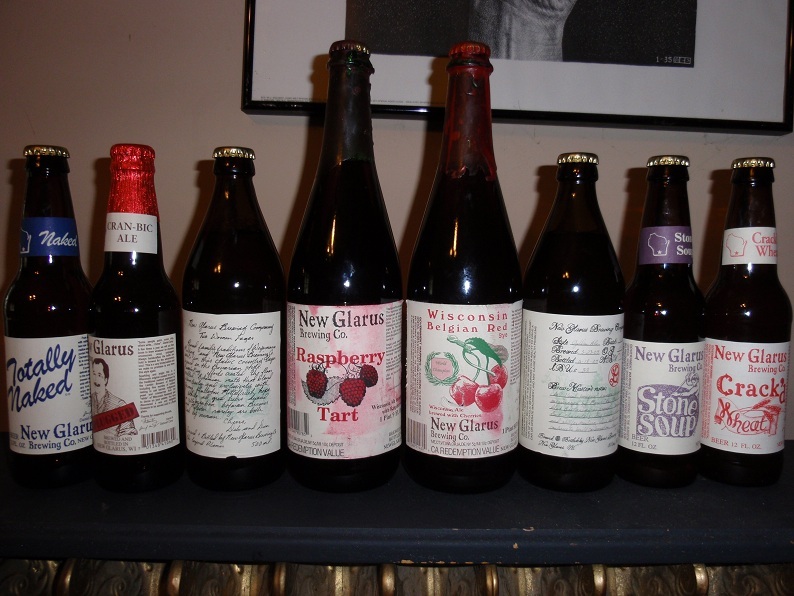 After bar close, a cab ride home and a New Glarus Cran-Bic night cap it was time to hit the hay for the big day ahead. As the big day came upon us we awoke a bit later than originally planned but I was grateful for the extra rest after a big night of drinking till 2am or so. After gathering our bearings we headed off to Stephen’s place to snag a few “golden tickets” as he was unable to make the event and were kindly greeted with some homebrew as well. Which will be enjoyed and written about some time in the future in conjunction with The Beer Genome Project. A short drive across the border and we were in Munster, Indiana. After grabbing some grub and some technical difficulties the adventure to find parking started. After driving through many parking lots and every street around we finally found a parking spot on the grass and unloaded our brews. 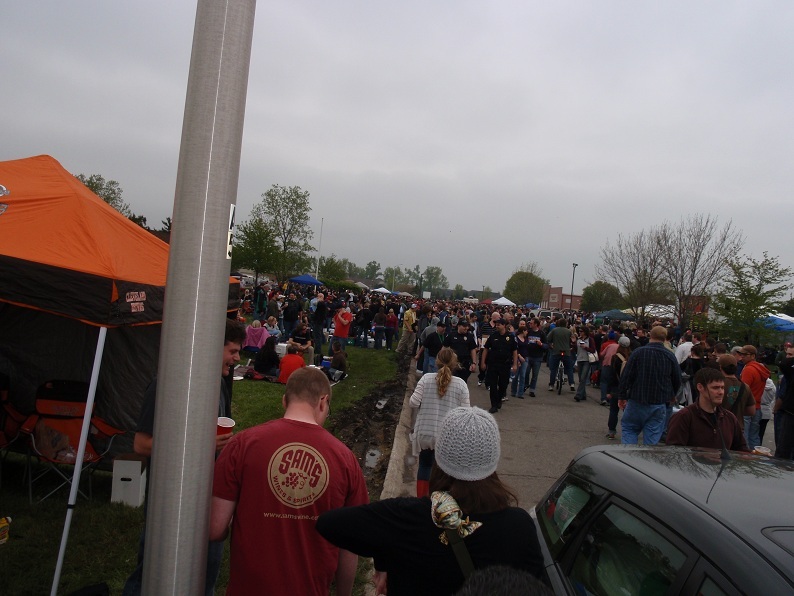 After walking a few blocks and my arms nearly falling off from the amount of beer being carried we observed the madness that is Dark Lord Day. The easiest analogy I can make is to imagine three blocks of tail gating but with good beer. Tents, grills and people as far as the eyes can see and 10 times as much beer. After finding my friends and dropping off my beer for safe guarding I made my way to the 3 Floyds tap tent and settled on a glass of Gumball Head a fantastically hoppy but very drinkable American Wheat Ale that was simply wonderful. After briefly checking out their large brewery and searching for my friend Stu I returned to our spot and sampled a few delicious brews including a side by side tasting of Dark Lord ’09 and ’10 as well as some Surly Darkness’ 09. 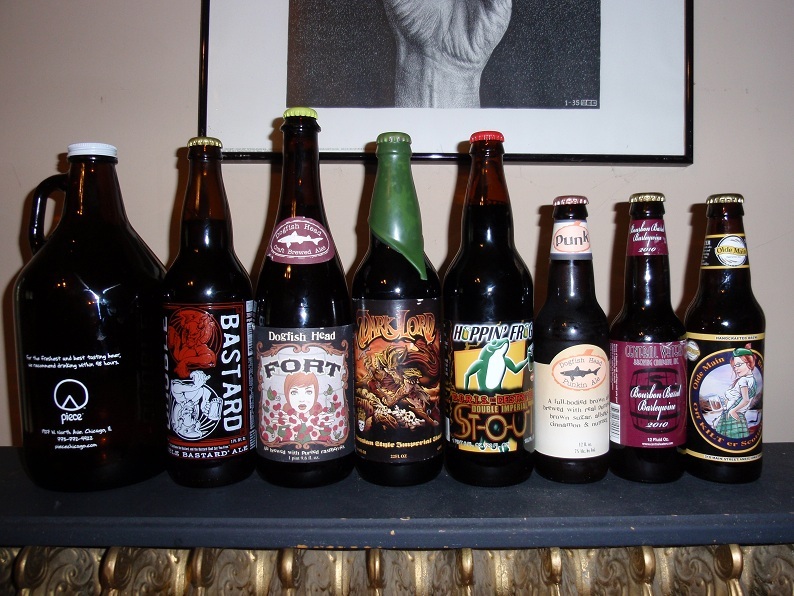 The ’09 Dark Lord had mellowed wonderfully and had gone from an almost offensively strong motor oil of a beer to a beer that fit the style perfectly and showed off the variety of flavors present marvelously. The ’10 on the other hand showed great diversity in flavors even with its young age and was much more drinkable and smooth than the ’09 had been when it was young. I will do a proper review sometime in the future. Shortly there after Stu showed up with a bunch of glasses ofÂ Vanilla Dark Lord which was very tasty and to me really brought out the chocolate characters of the beer which I found very enjoyable. We then ventured to the brewpub to acquire some Barrel Aged Dark Lord which was also quite tasty with gentle oak characters creating some nice mellowing esters. I then had to sample a half pint of their Dreadnaught a fantastic Imperial IPA and finished off with a glass of Barrel Aged Popskull a 10% Brown Ale collaboration they did last year with Dogfish Head and a simply phenomenal brew. If only I could have taken some home. A few trades and many samples later I found Shawn & Mike who were about to cart our allotted Dark Lord to the car and noticed it was almost 5pm so I hopped in line with my friend Jason to get some extra bottles of Dark Lord when the free for all happened. 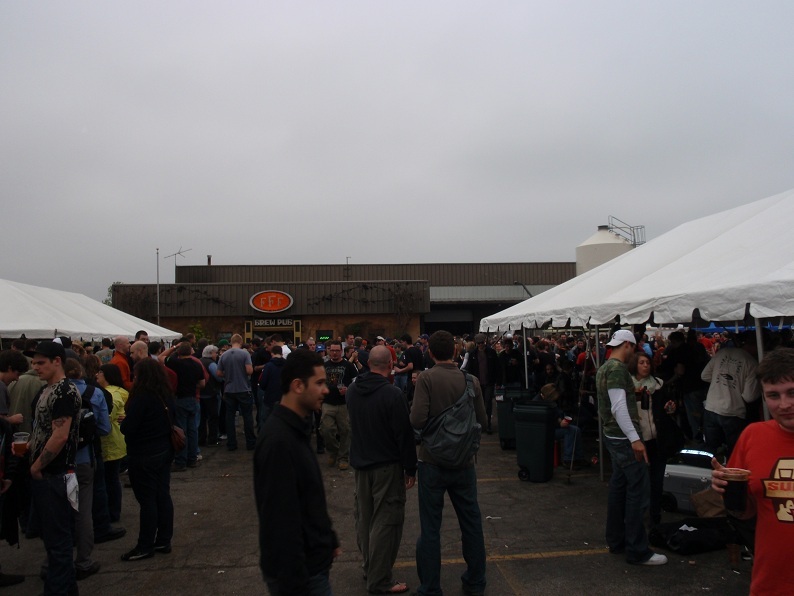 I was impressed with how well the 3 Floyds staff managed the hoards of people and managed to make the final sales run very efficiently. After a bringing our extra 3 bottles a piece back to our friends spot and some more consumption the weather gods finally decided to tear up on us. Finishing off the wonderful event in what became the trips constant fashion. Word had it that some of our friends were heading to the nearby Flossmoor Station Restaurant & Brewery so we figured it would be logical to to grab some food there as well. We ended up splitting a massive sampler of close to twenty brews and grabbed some grub. I enjoyed my cheese steak, though frankly I would have enjoyed most food at that point. Aside from the massive number of taps available in our sampler it wasn’t really that impressive. I remember enjoyingÂ a lager of some variety but my lack of taking notes isn’t helping here. After enjoying the sobering effects of some food we made our way back to Chicago and decided to check out the Small Bar Fullerton location which happened to be just down the street from where we were staying. Though our stay was short the bar was very nice and their tap selection was even more fantastic. We all ended up with glasses of The Lost Abbey’s 10 Commandments and were ever so pleased. Not only was it fantastic to be able to get such a beer on tap, it was also reasonably priced and wonderfully delicious. To wrap up our evening we meandered back to Piece Brewery andÂ had the opportunity to meet and chat with Tommy Werner and some other friends. As well as being entertained by karaoke and more delicious Dysfunctionale, which I couldn’t help but grab a growler of. After another long night it was time to pass out before the journey home. Aside from some crappy traffic in Wisconsin the trip home was pretty uneventful, but it was nice to be heading home. Overall Dark Lord Day was a fantastic event. If you are into craft beer and enjoy sharing it with others you will have a blast. 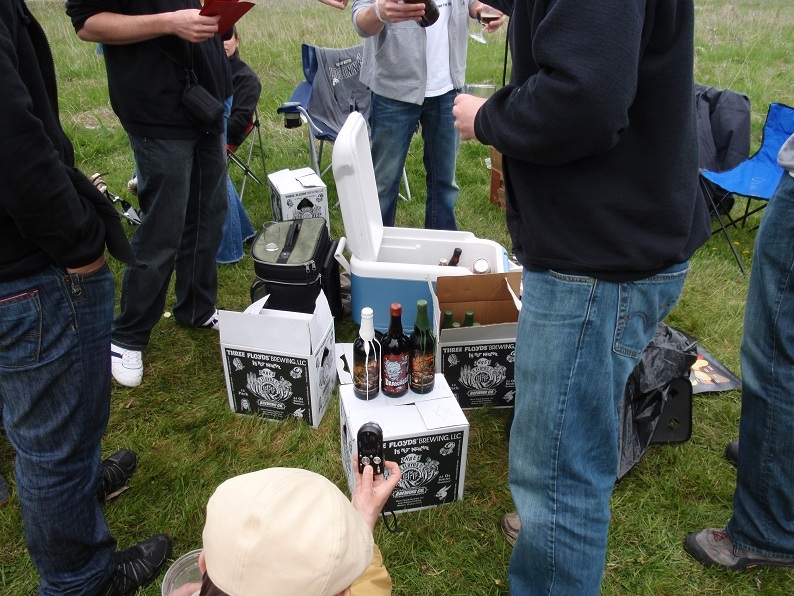 Never have I seen such vast and awesome display of beer lovers doing what beer lovers love to do: drink, share & chat. Not to mention all of the other great places one can stop en route to Indiana. Probably one of the best opportunities to sample and share beers you never thought you would be able to get your hands on. If you have the means and the time to ever participate in this event I highly encourage it. Golden tickets or not.